As I mentioned in a previous post, I was looking for recipes that I could use up food that I already had in the house so as not to purchase additional ingredients. Some times when I have undergone this effort in the past, I have a recipe already on hand. Too often, though, I have to do a quick google search of a few key ingredients and the word “recipe” and see what looks good. 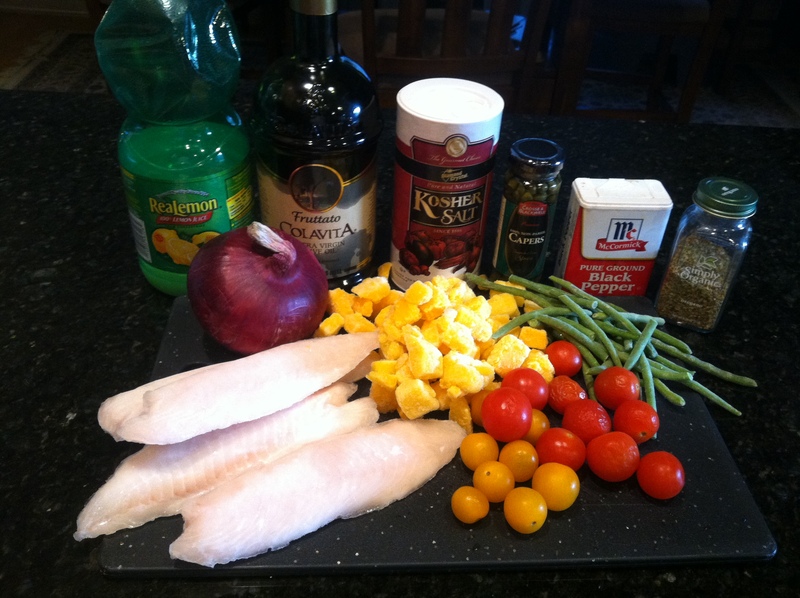 In this case I searched for some ingredients that I thought might go well together: talapia, tomatoes and squash. I found the perfect recipe for those ingredients and additional ones I had on hand (green beans and red onion). It was fresh, light and delicious. The recipe calls for summer squash, but I had cubed butternut squash and it worked very well. 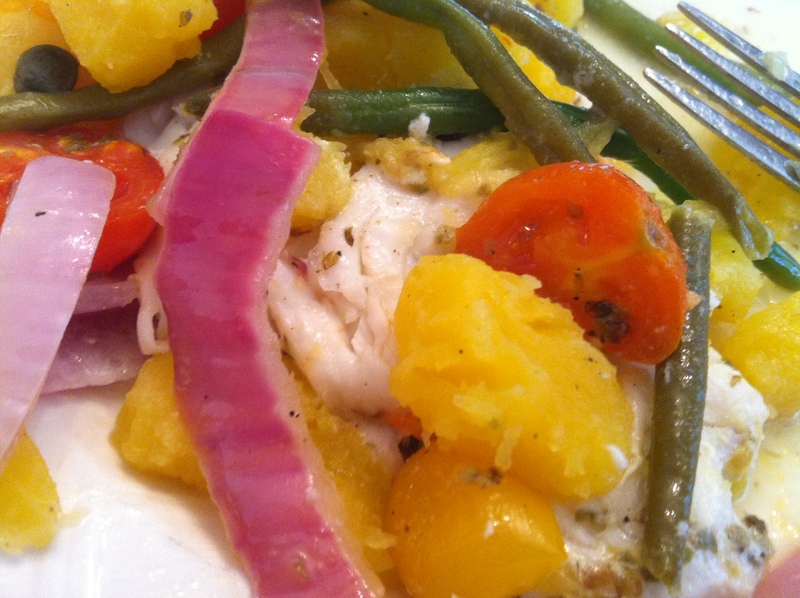 I made the packets the night before and the squash, beans and talapia were all just out of the freezer. I wrapped them up and put them in the fridge until ready to grill. 2. 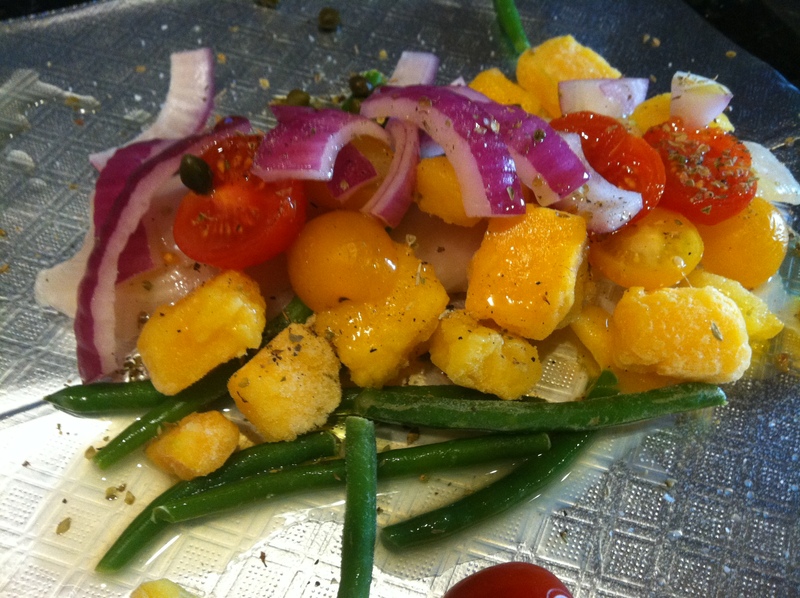 Combine tomatoes, squash, onion, green beans, olives, lemon juice, oregano, oil, capers, 1/4 teaspoon salt and 1/4 teaspoon pepper in a large bowl. 3. To make a packet, lay two 20-inch sheets of foil on top of each other (the double layers will help protect the contents from burning); generously coat the top piece with cooking spray. 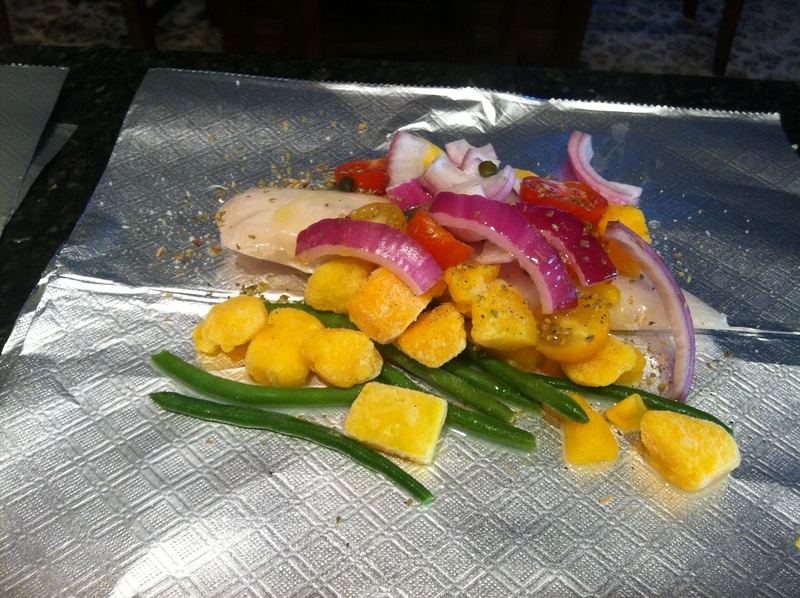 Place one portion of tilapia in the center of the foil. Sprinkle with some of the remaining 1/4 teaspoon salt and pepper, then top with about 3/4 cup of the vegetable mixture. 4. 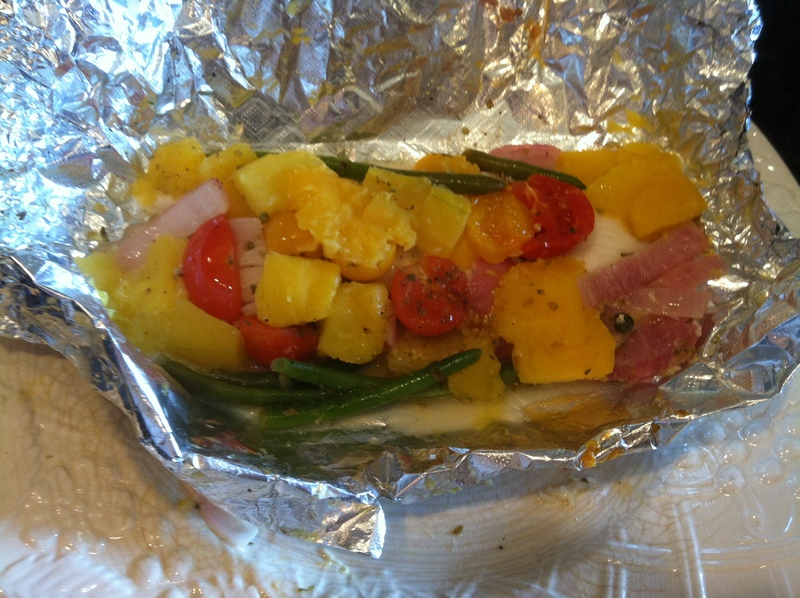 Bring the short ends of the foil together, leaving enough room in the packet for steam to gather and cook the food. Fold the foil over and pinch to seal. Pinch seams together along the sides. Make sure all the seams are tightly sealed to keep steam from escaping. Repeat with more foil, cooking spray and the remaining fish, salt, pepper and vegetables. 5. Grill the packets until the fish is cooked through and the vegetables are just tender, about 5 minutes. To serve, carefully open both ends of the packets and allow the steam to escape. Use a spatula to slide the contents onto plates. Oven Variation: Preheat oven to 425°F. Place green beans in a microwavable bowl with 1 tablespoon water. Cover and microwave on High until the beans are just beginning to cook, about 30 seconds. Drain and add to the other vegetables (Step 2). Assemble packets (Steps 3-4). Bake the packets directly on an oven rack until the tilapia is cooked through and the vegetables are just tender, about 20 minutes. 181 calories; 7 g fat (1 g sat, 4 g mono); 57 mg cholesterol; 8 g carbohydrates; 0 g added sugars; 24 g protein; 2 g fiber; 435 mg sodium; 591 mg potassium. 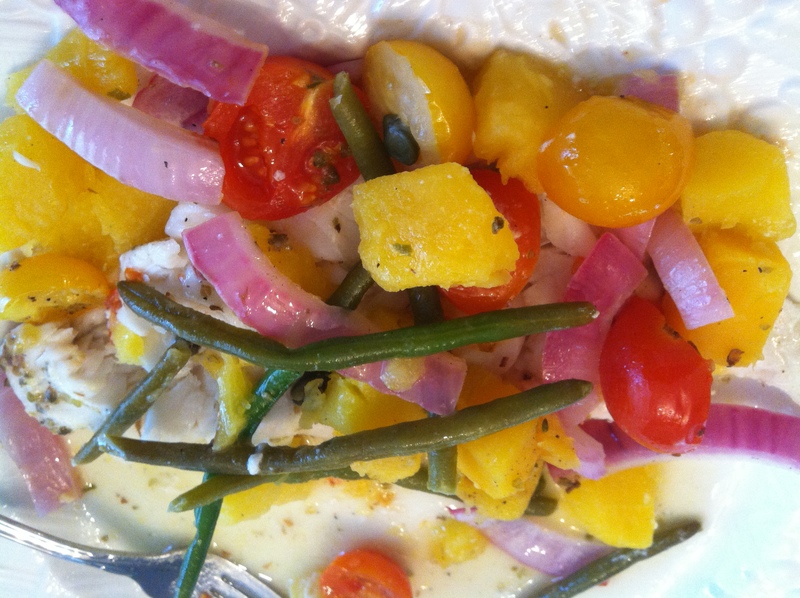 I’m always glad to find a tasty tilapia recipe. Tilapia is a great low-mercury fish. Thanks! I did this a few weeks ago with the zucchini, summer squash, tomatoes and garlic. Thanks for the idea for the other veggies. Healthy, easy and delicious…the perfect recipe! This sounds yummy, but I think I will use chicken! thanks, what a wonderful idea on what to cook for tonight’s dinner.. it is simple, fresh and delish.